These cartoon drawings of animals were chosen for their simplicity and aimed directly at the beginner artist. All you have to do is copy the drawings so you can feel how they are accomplished. A simple trick when drawing animation is to convert things into basic shapes. You can also use more than one shape to construct the body, depending on what animal you wish to draw. 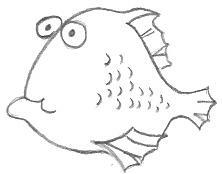 An easy way to create a fish is to draw a circle and then make the little changes that turn the circle into a fish. Let your pencil take over and see what comic book animals emerge. 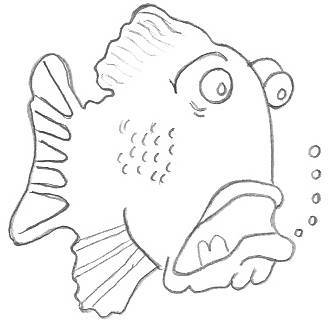 You can put expressions on the fish face to make the sketch funny, sad or whatever. 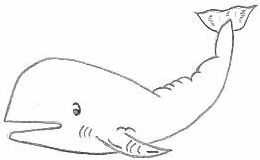 By studying the cartoon drawings of animals here, notice how a couple of curved strokes represent the scales of a fish. It's little details like that give the cartoon experience. Cartoonists put human expressions on animals to make them look funny so have a play around and experiment with distorting and exaggerating the animals features. When I drew the owl, I couldn't resist filling in some detail because he looked fairly ordinary without all the extra lines added. Take notice of the kind of squiggles you can use to bring character into the sketch. Studying other artwork is another way of learning and we can learn heaps by mimicing patterns and variety of strokes. 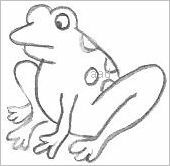 These drawings are in outline form so you can color them or alter them any way you want. You are welcome to copy and paste these cartoony images onto a page and then print them out for some coloring-in fun for the kids. Cartoon animals are usually such friendly little critters, I even love the frogs which is a bit different to my feelings about them in real life! Horses are a challenge for me so I rate them with a high degree of difficulty. I had a terrible time getting the legs right. 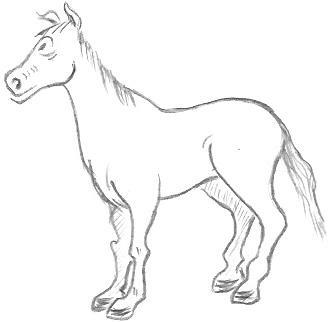 My drawing is not very good but my intention is that you get the idea on how to convert a horse into an animated character. You are the creator so let your imagination go free. For more complex animals, it may suit you to draw a stick outline and then fill in around the sticks. Don't get frustrated if you can't get a good drawing first time around. I know that drawing a proper horse was an easier process for me but that won't stop me from trying again. I still have some work to do mastering the cartoon horse and I think that's part of the fun! 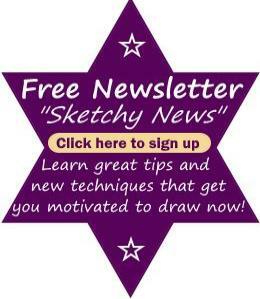 Do you think you can produce some good cartoon drawings of animals? If you haven't tried to do some drawings, grab your pencils now and do it while you are here. The majority of cartoon animals are easy to create, you only have to pick and choose what ones you like. I own a few good drawing books and they really help me with creating decent cartoon drawings of animals. With the very simplicity of cartoons, you can occupy yourself for hours of fun and doodling. Join me and we can learn about art together.